I was in a bit of a bind when I started Sapphire Blue. In the nine months since finishing the first book, Ruby Red, I had nearly forgotten what was going on. With only a slight memory of how the first book ended, I plunged back into Gwen's story of heinous extended family members, impossible boys, and mind-boggling time traveling excursions. Thanks to Kerstin Gier's carefully built in reminders of how the characters got to where they were, I was able to settle back into the world with minimal hardship, and fully ready to enjoy a good story. 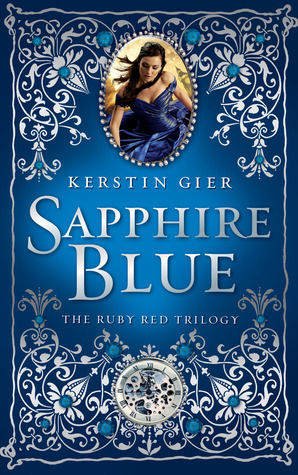 Sapphire Blue was a good continuation from the first book: an awesome main character armed with her signature humor, an exciting plot, and exquisite writing style. It was all business as usual. Until you're forced into a fancy corset and sensible shoes to visit a possibly evil count who, upon your last meeting, tried to strangle you. Points to Gwen, the feisty main character, for not flaking. Much. I love her slightly self-deprecating humor, even though I wish she would stand up for herself when some of her family members start railing on her. Her narrative was fun and easy to understand. The only thing I couldn't really understand was the plot. Time traveling makes my head hurt, which is why I generally steer clear of all the time traveling adventures. I couldn't really see a connection between most of the events. Something was decided and I was left thinking, "Why?" Because I was enjoying the narrative so much, I just went along with it. Though I came out of the other side with a question mark still hovering over my head. If there's one thing Kerstin Gier does extremely well, though, it's dialogue. It seems to be her main mode for setting the tone of a character. Why bother with copious descriptions when a single line of speech could tell you just as much, if not more? Gier really brings characters to life and presents them in a dynamic way that give them a 3D effect. I loved the two main characters, Gwen and Gideon, as well as Gwen's best friend, Lesley, and her demon ghost friend, Xemerius. Peppered with such lovable characters, I could really settle into the story. Thus far, the Ruby Red trilogy has been an enticing read that continues to thrill. 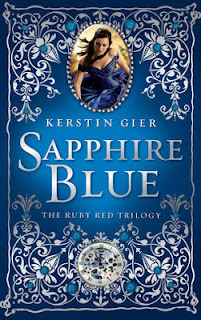 With the way Sapphire Blue left off on such a cliffhanger, I'm dying for the third and final book! "Young people, this is a church! No kissing allowed here!" "I think Lesley really does look a bit like a golden retriever," Xemerius had said, and when I looked at him reproachfully he was quick to add, "I like dogs, you know I do! Such clever animals!"